SEOUL, Feb. 7 (Yonhap) — A series of women have come forward with “me too” accounts of groping and other sexual misconduct they have suffered at the hands of men in positions of power since a female prosecutor bravely shared her own story last week. Lee Hyo-kyung, a member of Gyeoggi Province’s legislature, wrote on Facebook last week that a member of the council dropped his pants in front of her while singing and dancing at a karaoke bar after a dinner with other members six years ago. The “me too” wave is also shedding a fresh light on a poem that Choi Young-mi wrote last year about the groping that she suffered at the hands of a senior poet 30 years older than her. The poem, titled “Monster,” talks about how she ended up sitting next to the senior poet, notorious for groping young women, and suffered what she had feared. Choi also said in the poem that she later rose up against the senior poet after seeing him groping another women at a year-end party. The “me too” wave has also hit the movie industry. The revelations came as the victim posted a piece of writing saying she’s joining the “me too” movement. The victim also wrote about how other people had tried to silence her and persuade her to drop the accusations. Political circles are no exception to the “me too” wave. Ryu Yeo-hae, a former member of the Supreme Council of the main opposition Liberty Korea Party, filed a lawsuit this week against the party’s leader, Hong Joon-pyo, claiming that Hong grabbed her hand against her will and insulted her. 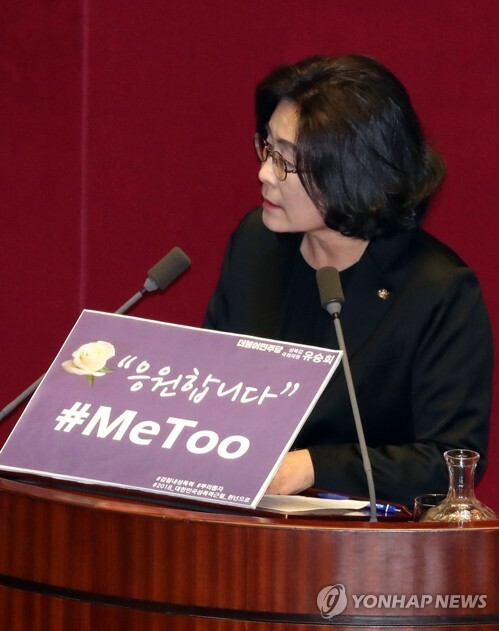 During a parliamentary interpellation session Tuesday, Rep. You Seung-hee of the ruling Democratic Party took the podium of the National Assembly with a sign saying that she supports the “me too” campaign. Ordinary people have also increasingly been stepping forward with their “me too” accounts on Facebook and other social media. The public is overwhelmingly in support of the “me too” campaign.